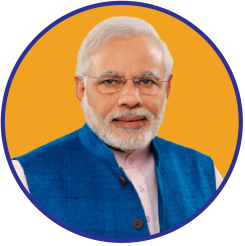 Narendra Modi is the 14th Prime Minister of India. He has been in power since May 2014. Before he became the Prime Minister of India, Modi served as the Chief Minister of Gujarat from 7th October 2001 to 22nd May 2014. He was the member of Lok Sabha for Varanasi and the Gujarat Legislative Assembly for Maninagar. Modi entered the world in the year 1950. He did not come from a well-off background but he did not let it affect his big hopes and dreams. He has worked his way up the ladder. Narendra Modi has the 2nd most popular social media account. He has millions of followers, who respect his ideas and policies. Born in a humble family in Gujarat’s Vadnagar, Modi did not have any luxury before he entered politics. Young Modi helped his father to sell tea to the customers. Later, he ran his own tea stall near the bus terminal with his brother. 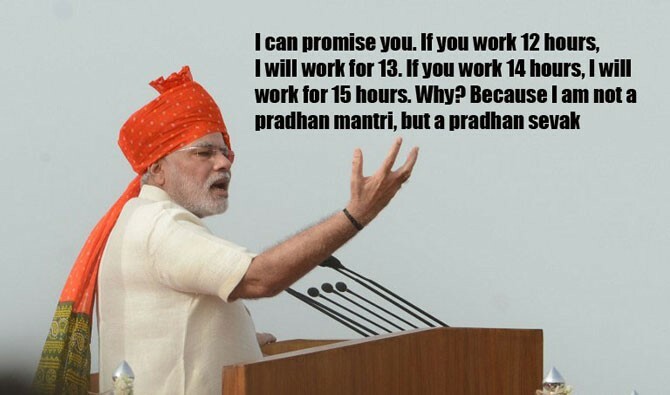 He was not bright in studies but his teacher thought that Modi was an excellent debater. He had keen interest in theatre and loved to take up the lead characters in the play. At a young age, he was introduced to RSS and that was the beginning of his association. Narendra Modi left his family after graduating because his family forced him to do an arranged marriage. He was engaged to a lady called Jashodaben. He married her at an early age but it did not last for long. He rejected the marriage and left his home in the year 1967. He travelled around India. He visited many religious centres all over India. After travelling for two years, he returned to Gujarat in the year 1971 and he joined RSS as a full-time worker. When Indira Gandhi declared a state of emergency, Modi had to hide because RSS was banned during that phase. While he was hiding, he wrote a book called, ‘Sangharsh Ma Gujarat’. Modi completed his graduation from Delhi University and got a degree in Political Science. He did his Master’s from Gujarat University. Although he was from a poor background, he finished his studies and became a great leader. The signs were there because he loved playing larger-than-life characters in plays. He always wanted to lead. In the year February 2002, Narendra Modi served as the Chief Minister of Gujarat. In the year 1998, he became the organizing secretary of Bharatiya Janata Party’s Gujarat Unit. He became BJP’s National Secretary in the year 2003. Narendra Modi is the 14th Prime Minister of India and he is playing the role efficiently. The nation worships him for his noble ideas and policies. He has brought significant changes in India. As the Prime Minister of India, Narendra Modi has launched many effective policies and schemes such as Swachh Bharat Abhiyan, Make in India, Digital India and Digital Literacy. His economic policies have benefitted the nation. He promotes sanitation and his Swachh Bharat Abhiyan has changed the face of the country. Earlier, women used to go to far-off places because there was no washroom in the home. Now there are toilets in remote areas as well. Narendra Modi disclosed his annual salary in the year 2016. His annual income is 1.4 Crore but he admitted that he does not carry a lot of cash with him. He does not own any aircrafts or private jets. He wears four gold rings which costs 1.18 Lac. He does not own any agricultural land or a commercial property. It is clear that the Prime Minister of India does not have any black money. After reading all the quotes, we do notice that he is focusing on building a better nation for the poor people. He wishes to build an egalitarian society. Narendra Modi is the man, who believes in actions and not words. He has always worked for the country and helped those, who are in need. He thinks about the people of his country. The demonetization phase helped in ending corruption to some extent. The nation was witnessing filth in every corner. With Swachh Bharat Abhiyan, we have seen major improvements in remote areas and cities. His vision is clear that he wants to build a better nation that everyone wishes to visit in near future. He strives each day to build better relations with other countries. He is a fantastic speaker and we can see his efforts to build a better, brighter and advanced nation. We are happy that we have a noble and honest leader like him.